A hotel can shape your entire experience of the city that you are visiting. For that reason, I love staying in historic properties with my family. These are places with an interesting story to tell, and the best ones weave this story throughout your stay in details small and big. 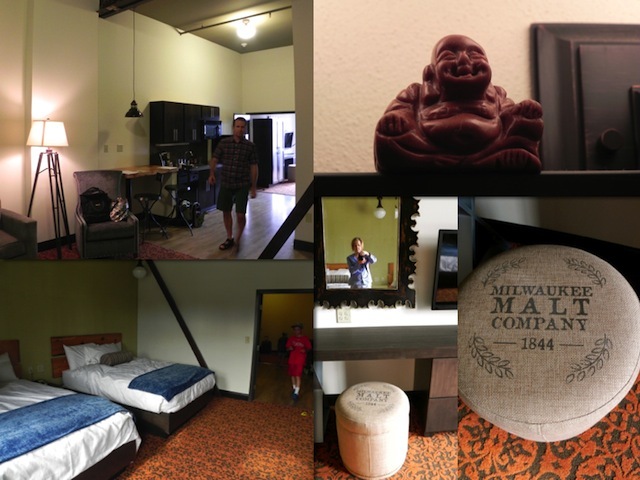 Few hotels can boast of doing so – and doing so more comfortably – than Milwaukee’s Brewhouse Inn and Suites, where my family and I enjoyed a complimentary stay. 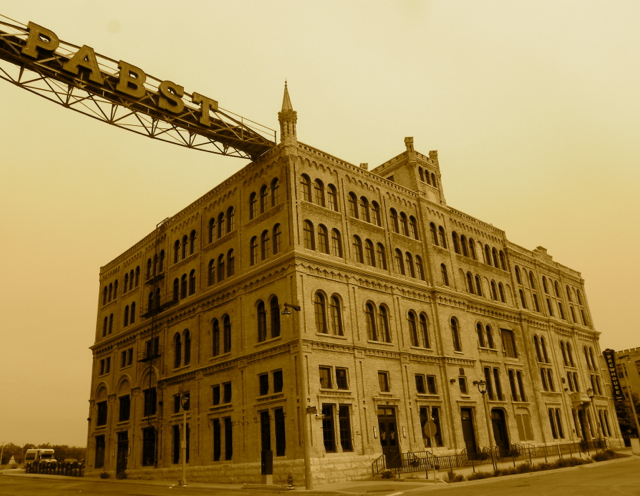 When the workers at the Pabst Brewery in Milwaukee were escorted abruptly off the huge premises in 1996, it was the end of an era. For over 100 years, this building and the beer it brewed had dominated the city’s landscape and psyche until the sudden closing of the entire complex when the company went out of business. Empty for over a decade, the sprawling industrial wasteland sat at the top of the city as an empty reminder of what once was. The 20-acre brewery has been reborn over the past seven years under the oversight of local philanthropist Joseph Zilber. It is now a LEED-certified, sustainably developed neighborhood, and the latest jewel in its crown is the Brewhouse Inn and Suites, a luxury extended-stay hotel housed in what was once the main brewery building. I know that this picture looks like an antique postcard, but in this is what the hotel looks like. It’s size and imposing nature really can’t be overstated. What I really loved about this Milwaukee hotel is the way it has retained the story of the building’s original function. 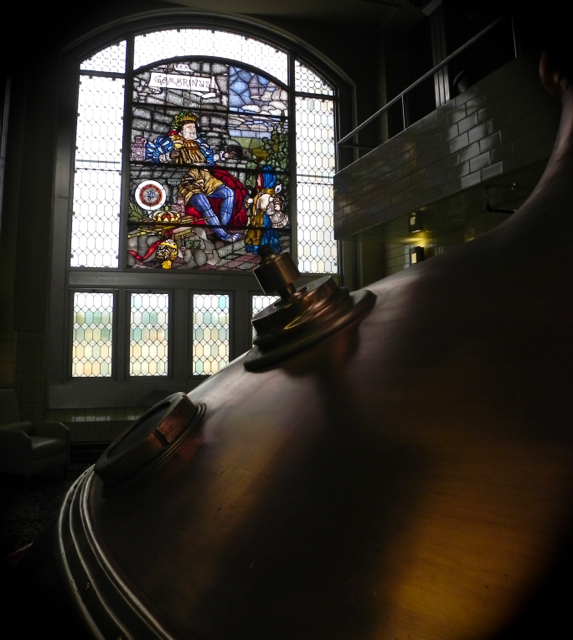 Huge copper vats that once held beer on the main brewery floor now dominate the second-floor lobby area under the benevolent gaze of a stained-glass King Gambrinus, the patron saint of brewers. 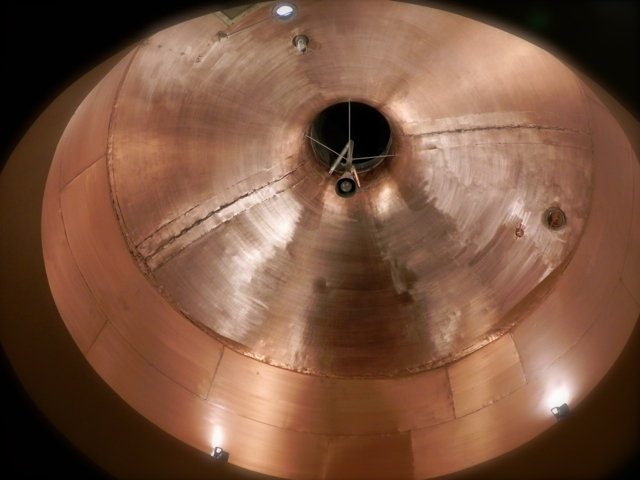 Look up when you check in and you will see the underside of one of the vats. 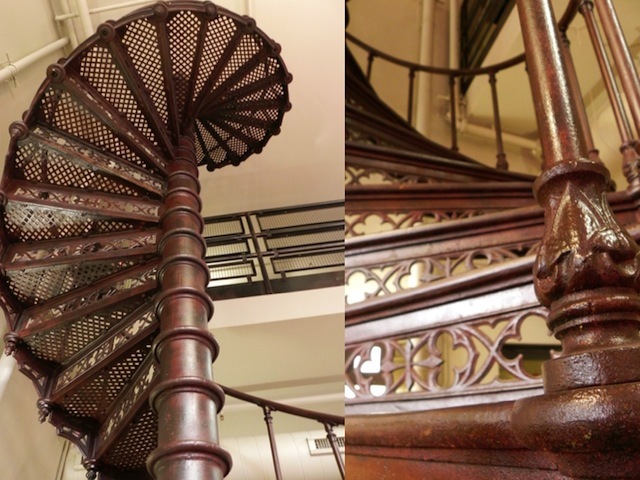 A spiraling cast-iron staircase is no longer usable but has been left as a sculptural reminder of the workers who traveled from one level to the next, busily checking the status of the beer. Our huge two-queen-bed suite retained the feeling of the old brewery as well, with soaring ceilings, exposed beams and enormous windows. Decorative details reflected the history of the building, with reference to the making of beer even on the small vanity cushion (the hotel website calls the decor “steampunk Victorian”). Wherever possible the hotel’s designers used reclaimed and found materials. This is a space built for comfort, with a well-equipped kitchen that included a full-sized refrigerator and dishwasher, a large bathroom (we loved that our sink was presided over by Buddha), and separate living room area with a sleeper sofa. 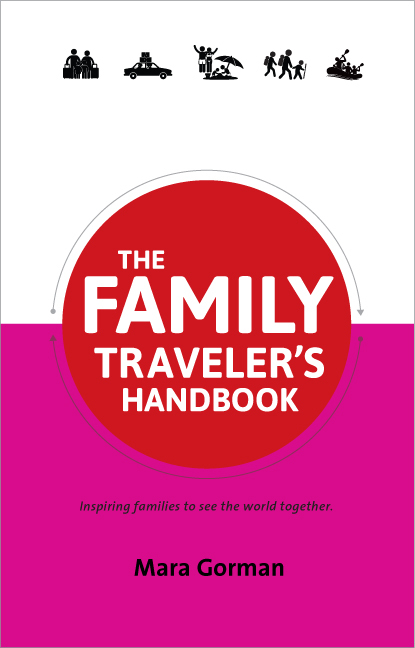 There was more than enough room for our family of four to sleep and work comfortably. At night Matt and I put one boy down in each bed and went into the living area to work, then moved a child to the sleeper sofa when we were ready to retire. I got so distracted by taking photos of the second-floor lobby that I neglected to photograph the lovely spread at breakfast downstairs, which was a full continental service complete with some home-baked coffee cake. The hotel also houses Jackson’s Blue Ribbon Pub, which is absolutely not to be missed for a meal. Eventually the entire neighborhood that houses the hotel will be completely redeveloped and I expect there will be many more atmospheric restaurants and shops. 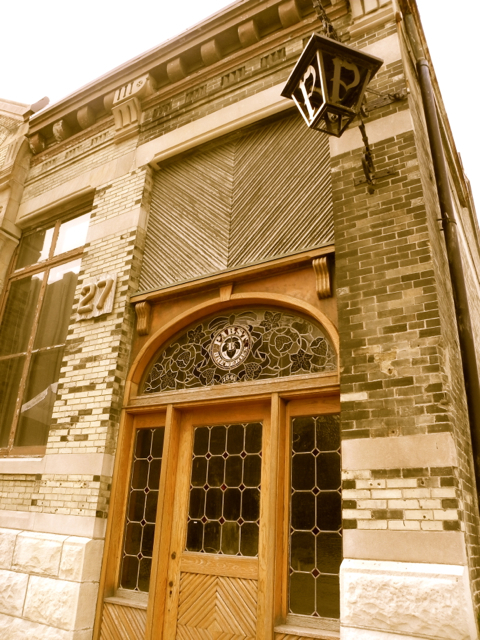 Right now it is home to the Public Health Campus for the University of Wisconsin-Milwaukee as well as Best Place, once site of the Brewery’s offices where you can now take a historic beer tour, shop for Pabst memorabilia in the gift shop, and sit and have a beer in the tavern. It’s also one of the best examples of artful urban decay that I’ve ever seen – a true photographer’s dream. If you want to continue your immersion in the Pabst story, you might do as we did on our last morning in Milwaukee and visit the Pabst Mansion, the beautifully preserved home of the brewery’s founder Captain Frederick Pabst (“captain” because he started his career as a cabin boy and then captain of a Great Lakes steamer). The house has all of the original mirrors, shutters, and woodwork and is a monument to high Victorian splendor and the fact that the Pabst Brewery was once the largest in the world. Captain Pabst was proud to be a Milwaukean, and the beautifully carved wood that and ornate fireplaces were created not by European artisans but by local craftsman. 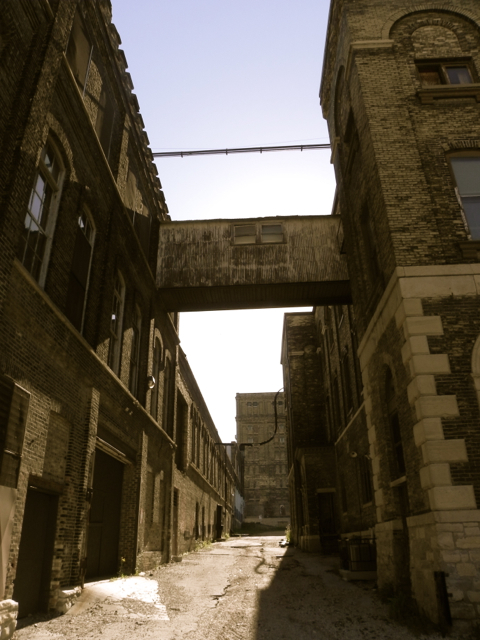 It was one more reminder of just how intrinsic this family and their beer was to Milwaukee. Staying at the Brewhouse Inn and Suites is a way to be part of this continuing story. It is easy and stress-free to drive around Milwaukee. The Brewhouse Inn and Suites is easily accessible from the city’s main arteries and offers in-and-out valet parking for a daily fee. You can safely and easy walk from the hotel down to the three-mile Riverwalk pedestrian path and the restaurants and shops in the Old World section of Third Street, where we dined at Mader’s. The Brewhouse Inn and Suites has free wifi throughout the hotel and the breakfast is complimentary. With rates starting around $189 and ample space in even the studio suites, I think this Milwaukee hotel is a great bargain for families. Many thanks to the Brewhouse Inn and Suites and Visit Milwaukee for providing us free accommodations at this unique Milwaukee hotel and to the Pabst Mansion for the free tour. 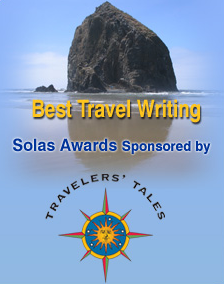 My opinions about our stay (and everything else you’ll find here) are my own. I love it when people get creative and turn something into something else. 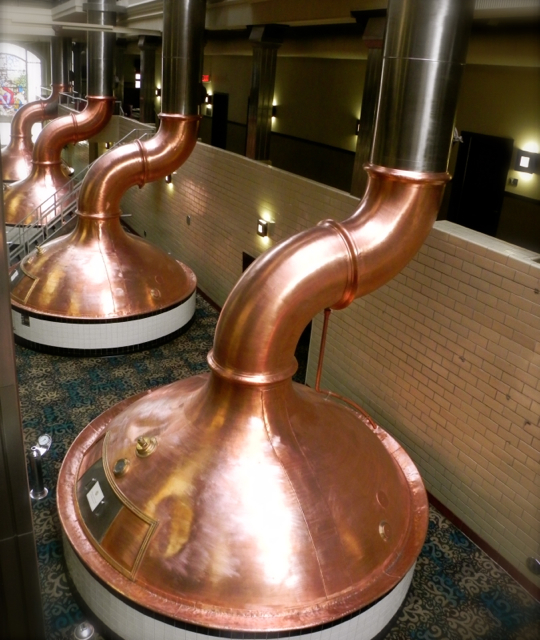 Who would have ever thought to create a hotel out of an old brewery. Whoever thought it up is pure genius. 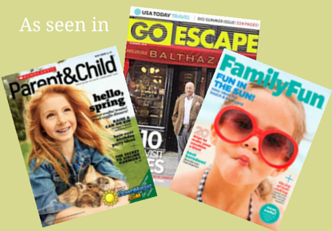 What a way to preserve history and share it with the world!